The Wilson Family welcomes you to Fairbanks, Alaska and invites you to take a nostalgic step back in time. The Aurora-Express offer visitors a unique Alaskan Bed and Breakfast experience. Nestled on sixteen and one half acres of towering spruce, you will enjoy panaoramic views of the Tanana River, the Alaskan Mountain Range and the City of Fairbanks. 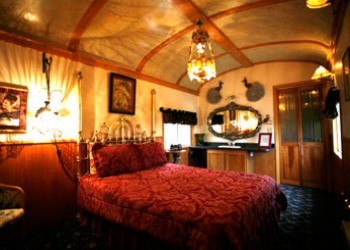 Your choice of accommodations includes numerous trains renovated to historical periods. 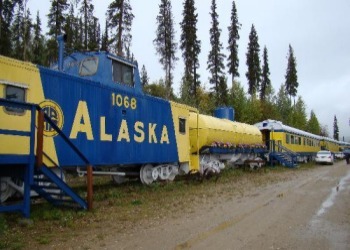 The Aurora Express is truly a part of Alaskan history. 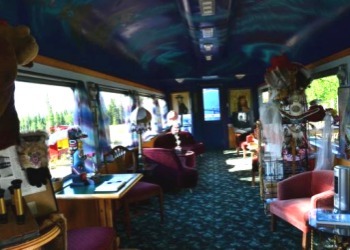 Mike and Susan Wilson purchased the trains from Denali State Park Hotel, where they had been in service as Hotel Rooms. The majestic trains are now permanently situated on 700 feet of railroad track overlooking Fairbanks and the Tanana Valley. Originally named by the Pullman Company, "The National Domain" has been renovated into four elegant suites, featuring queen-sized beds, private baths, and entrances. Each room is individually decorated and unique. Arched ten foot high ceilings have been hand-painted by a local artist, Josef Paul, reflecting the 'grandeur' of a bygone era. Heavy burgundy drapes trimmed in gold fringe and magnificent cherry stained walls compliment the Victorian-styled suites. "The National Emblem" has been restored to its original state, and provides the cozy accommodations which grand sleeper cars offered in the past. This car is an excellent choice for large families or groups traveling together. Another car, "The Golden Nellie" was originally titled Caboose #1068. It has been superbly restored as a private suite-car for those who demand the ultimate in luxury and privacy. Golden ceilings, heavy burgundy velvet drapes and a queen size bed will have you feeling as if you were an old-time railroad magnate. Even the original chairs are there and have been recovered with beautiful brocade fabric. A golden ladder leads you up to the covered observation deck above. The "Arlene", originally used as a hospital car during WWII, has been remodeled to a private 85-foot car with 2 bedrooms including a queen size bed and 2 twin beds. This car provides a private bath and living room with a T.V. We are extremely proud of our latest addition... "The Diner Car" is an eighty-five foot long car boasting seating for twenty-four, with a separate seating area with telephone and television. A ten foot high arched ceiling is adorned with a Mural of an eight foot Bald Eagle soaring in the Northern Lights (mural painted by Milo Marks an Athabaskan Indian from the Nenana.) An exceptional breakfast is served at 8AM sharp, sometimes with "semi-live" entertainment.